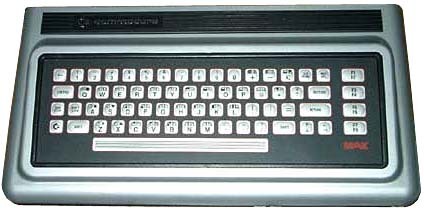 The Commodore MAX was released after the VIC 20 and at the same time as the C64. It was intended to be Commodore�s low-end offering ($150-180), whereas the C64 was envisioned as a high-end product ($595). The system was very inexpensive and lacked even basic features such a user expansion port. In reality, the MAX was a severely limited C64. Several MAX software titles could actually be run on the C64. Some production models used the same video chip as the C64, while others used a 6566 (the NTSC C64 uses the 6567; the PAL C64 uses a 6569). Regardless of video chip, both variants offered only a single graphics resolution of 320x200 and could not utilize the �multi-color� functions available on the C64. The SID sound chip is identical to the one found in its C64 cousin. BASIC was stored on cartridge rather than in ROM. Though initially planned for world-wide release, the Commodore MAX was sold primarily in Japan. It was advertised in North America under the name ULTIMAX, as well as in Germany under the name VC-10. Thanks to Dr IDO for some information. see more Commodore MAX Machine / Ultimax / VC-10 Ebay auctions !